Most people want to achieve in their life and work, and to improve over time. Most organisations understand some of the best practices in performance management and achieve through their peoples performance. So why do you as an individual sometimes feel frustrated, disappointed and/or dissatisfied with the recognition of your performance, with the level of progress and/or the organisations ability to help you give your best and improve and progress. This short paper provides a guide to you and your organisation to enable you to “Take control of your performance” through collaboration with stakeholders and the organisation to “Make you central to their success”. The Individual (you): Your role is to take control of your own performance end to end. This means you are central to setting the Goals, Objectives, Performance standards & indicators, monitoring progress, seeking and receiving valuable guidance and feedback. You own the process whether in your personal life or career. Experience tells us this is what works best (Owner of My Performance). 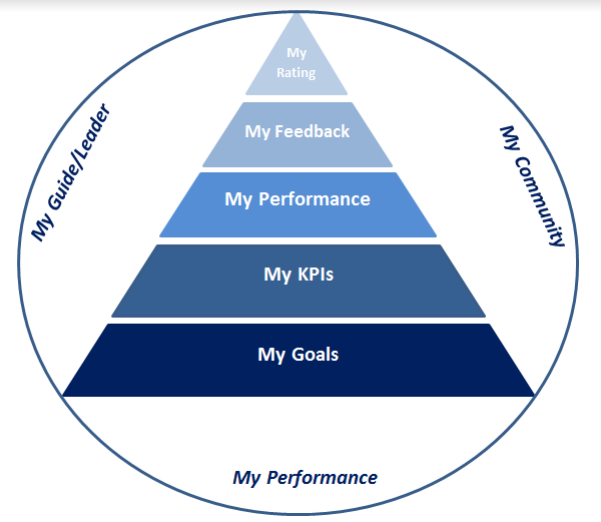 My Performance Guide/Leader (Manager, Coach, Leader, Mentor): In most scenarios we have one primary individual who is committed to our performance and progress and who often also have a vested interest in your performance. In business organisations that is normally your line manager/supervisor, In sports it is likely your coach. Their role is to ensure that your motivations, contributions, and outputs are aligned with the organisations and team priorities and goals. They also have the wisdom , experience and motivation to provide you with knowledge, advice and information on how to improve, coupled with valuable feedback on your progress. 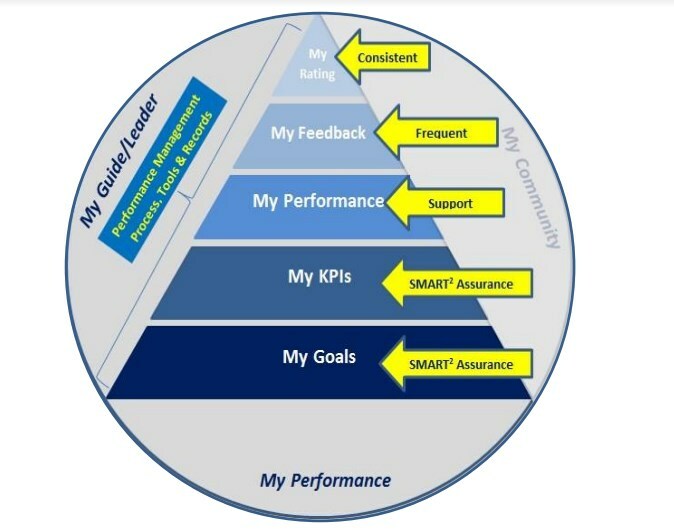 They usually can mobilise necessary resources you identify and agree are appropriate to improve your performance and capabilities (My Performance Guide). 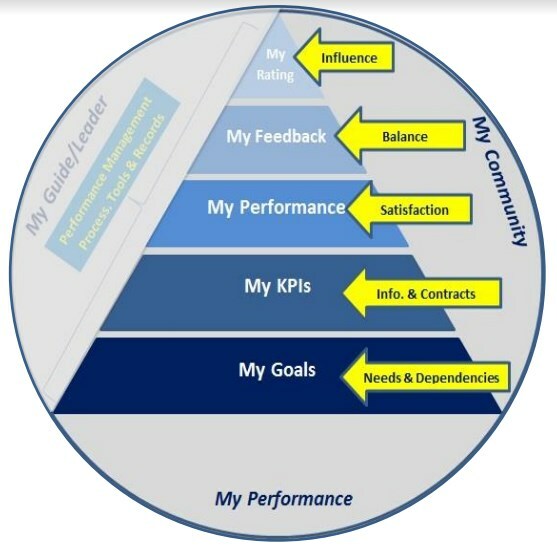 My Performance Community (Peers, Team mates, colleagues, customers, suppliers): Each of us has a community of stakeholders we interact with on a day to day basis. They are the people around us that we are dependent on, or they are dependent on us in some way to perform successfully, they are also the people we interact with and help of they help us day to day. They place a value on your performance and likewise we value their feedback especially those that are key suppliers or customers for your day to day role and its inputs and outputs (My Performance Community). The key considerations for taking control of your performance are highlighted in the model . Firstly you need to set a manageable and realistic set of goals/objectives and Key Performance Indicators (KPI). Remember you may have others who you wish to consult before you finalise and/or commit to these goals and KPI’s. Within an organisation your Guide/Leader may have a vested interest in you achievement of your goals and performance targets. In addition perhaps those who receive or are impacted by the output of your role (Your Community) will also have a vested interest. They will help you determine the priorities and attributes for your goals/objectives and KPI’s. 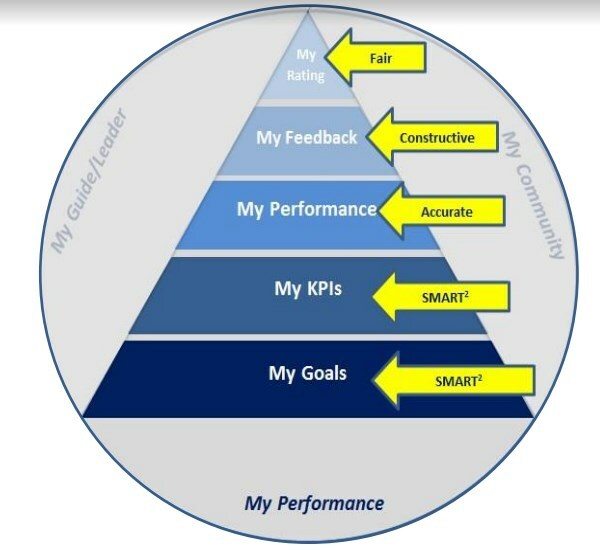 The SMART model has served as a good guide for many years in stating goals and KPI’s, and in recent years has been updated to further strengthen the power of the guide and test for goals and KPI’s using SMART2 where each letter has two uses to guide you in setting great goals. It’s important to know how you are performing against the targets you have set in terms of Goals & KPI’s and to review and record progress regularly. Not only should you record important detail like achievements, deliverables, standards achieved but you want to have aggregate indicators you can use to get an overall feel for your performance and share as appropriate with you Guide & Community. 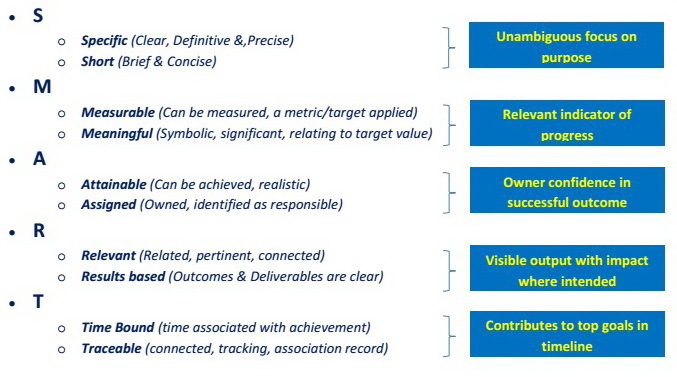 Metrics, Indicators & dashboards are useful tools for performance and progress measurement and communications. Example used is KPI courtesy of www.siriusperf.com (Goal indicators are similar). At a detailed status level (Example used below is a Goal). Your guide may be your line manager, team leader, coach, it’s the person who has responsibility to you and for you and to whom you respond in the context of the role, goal and/or KPI. Generally they will provide the organisations performance management process, system and tools for you, but in this social, collaborative digital world communities often form and adopt a tool that the guide then adopts. The guide is there to support you and facilitate your best performance. On occasion a guide may be directive, this is acceptable when the situation or you may need direction. However its long known directive approaches are demotivating in most cultures, and it is a rare occurrence these days where your guide style is totally domineering and directive. This mitigates against the principal of this model which is based on you the individual having full control and ownership for your performance. The guide will have the knowledge and experience to support you set SMART2 Goals & KPI’s Their role is more an assurance role, validating that the Goals and KPI’s you set are relevant to the situation, to your personal capabilities and your development needs, and also in line with the performance standards for your role and in line with the organisations priorities. Knowledge, Skill and Domain expertise as a source of help, support and direction. Knowledge & Information relating to the bigger picture that you may not have. Access to and/or influence over supporting resources to enable you achieve your best performance and improve it over time. Help you understand Strengths, Weakness, Opportunities and Threats that relate to your performance and prevent or correct the items that are or could detract from your performance, while leveraging the Strengths. Because your guide has a vested interest in your performance and the related outcomes and deliverables then he/she will have useful and valuable feedback both tactical and strategic. In fact the most powerful element of all performance management systems are the meetings and discussions you have with your guide. Do you meet your commitments to yourself, the organisation and community teams and members. 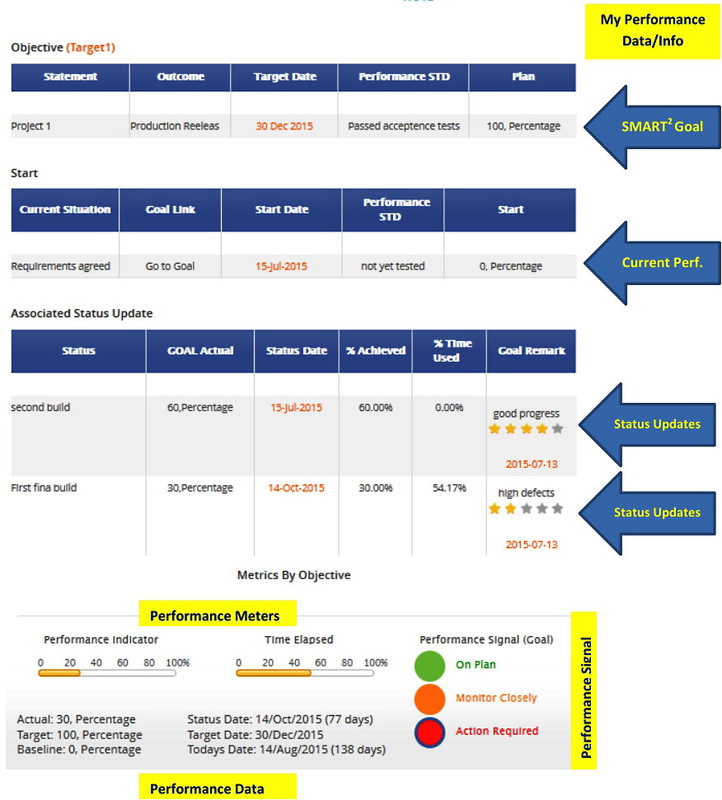 Are the deliverables from your tasks, activities and projects to the required performance standard or better. 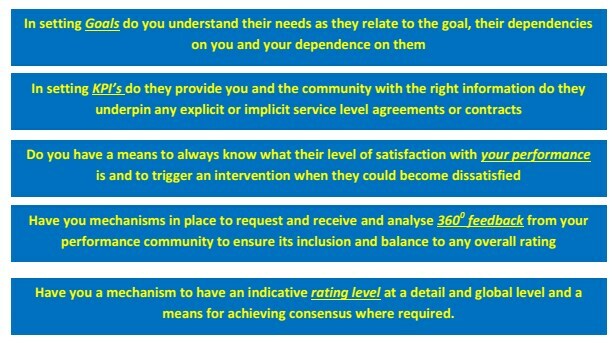 Do you comply with relevant processes and systems relating to your role and do you help improve these. Are your knowledge, skills, competencies and capabilities improving as indicated by your performance. Have you established effective personal and/or professional relationships with members of your performance community. Do you have a positive impact on community members and the organisation units you touch. Do you understand your potential and, are you ambitions aligned with your potential and the organisations future needs. Are your attitude, style, commitment, flexibility, creativity, making a positive contribution to the environment and culture. There are subjective and objective elements to performance management. 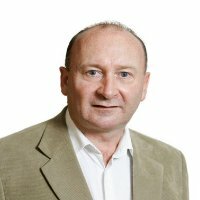 In this paper we come at it from a management science perspective and our model brings practical best practice and some engineering techniques that make it as objective as possible. That said we are humans with a set of characteristics and behaviours that are unique to us as individuals and in general we interact with other people in our work or life communities who experience the best and sometimes the worst from us. We described at the start of this paper who those community members might be in certain scenarios. These performance community members may be dependent on your outputs direct and indirect, tangible and intangible. They may be providers of process, materials, information or other resources you are dependent on directly or indirectly. They may be peers, subordinates, project or team colleagues, bosses, shareholders, citizens and many other scenarios.